Tom Cable gets his guy, again. After trading back from pick No. 10 to No. 15 in the first round 2018 NFL Draft on Thursday, the Oakland Raiders added former UCLA offensive tackle Kolton Miller to their stable of offensive linemen, a 6-foot-9, 309-pounder new offensive line coach Cable reportedly fell in love with in the pre-draft process and pushed hard for in the war room. We at Pro Football Focus wouldn’t use the word love if we were to associate our affection of Miller in one word at this point of the draft. He was a third-round player on our board and our seventh-ranked offensive tackle, so we’re clearly not enamored with this pick in the first round, but let’s examine what Cable and the Raiders fell for. Miller’s run-blocking, took a significant step in the right direction in his final collegiate season. After earning a 52.6 run-block grade in 2016, Miller earned an 80.2 run-block grade in 2017, ranking 23rd among draft-eligible offensive tackles. 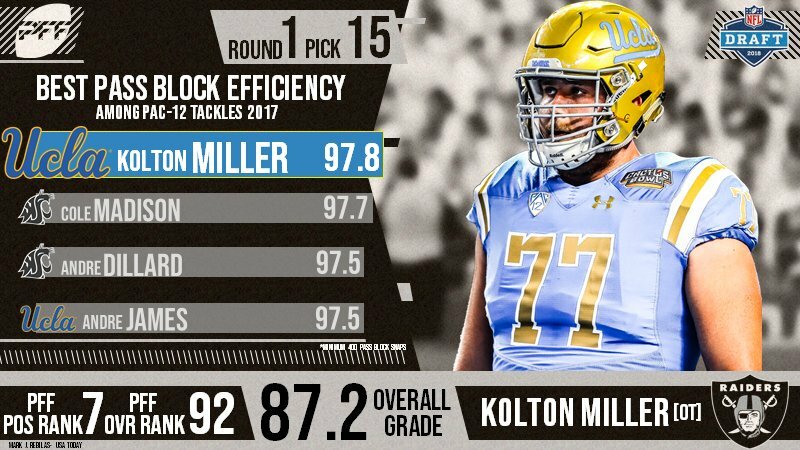 In 2017, easily Miller’s best year with the Bruins, he allowed 16 total pressures, including six hurries, eight hits and two sacks, in 578 pass-block snaps, awarding him the 11th-ranked pass-blocking efficiency among draft-eligible offensive tackles with at least 390 pass-block snaps a season ago. He also earned an 89.0 pass-block grade for his efforts last season, which ranked third in the draft class. And, likely music to Cable’s ears, Miller’s above average marks in pass protection weren’t byproducts of perfect technique, meaning Miller’s best game is likely ahead of him and attainable with proper, next-level coaching. Miller has a tendency to lose the leverage battle by playing high, and his footwork hasn’t done him any favors, either. He sets his feet wide in pass protection and will often allow contact to slow or stop his feet to a point where he can’t recover in time to avoid allowing a pressure or sack. More apparent in his 2016 tape, Miller’s technical flaws led to poor production across the board throughout his shortened redshirt sophomore campaign. Prior to going down with injury, he allowed 18 total pressures (11 hurries, six hits and one sack) across 190 pass-block snaps through five games at right tackle, leading to 69.9 pass-block grade and a 62.9 overall grade. Miller’s lackluster technique paired with elite size and athleticism make him a developmental prospect with considerable upside, a label Cable has seemingly been drawn to in recent years. Cable has brought on similar offensive tackle projects to Miller all throughout his tenure as an NFL coach, his most recent investment being former Seattle Seahawks first-rounder Germain Ifedi. Like Miller, Ifedi had all the measurables an NFL coach wanted in an offensive tackle, but he was still far from a polished product. In his final year at Texas A & M, Ifedi ranked T-40th in pass-blocking efficiency (96.2) in the 2016 tackle class, and as expected, his technique was the root of his poor production. He received a sixth-round grade from us prior to going 31st overall in the 2016 NFL Draft. Unfortunately for Ifedi, Cable’s magic didn’t quite turn the young tackle’s career around in their two years together in Seattle. Under Cable’s tutelage in 2016 and 2017, Ifedi earned 34.2 and 48.6 overall grades, respectively. To avoid turning Miller into what is showing early signs of a failed project in Ifedi, Cable will need to dial in on Miller all offseason and work diligently to improve his technique prior to casting him into the fire with a starting nod in Week 1. Of course, if Cable can indeed work the magic head coach Jon Gruden believes he’s capable of, Miller has the size and athleticism to develop into a franchise piece along Oakland’s offensive line.